Surah Muhammad (The Praised One): Exegesis of 47th Chapter of the Holy Quran ~ Islam My Ultimate Decision . 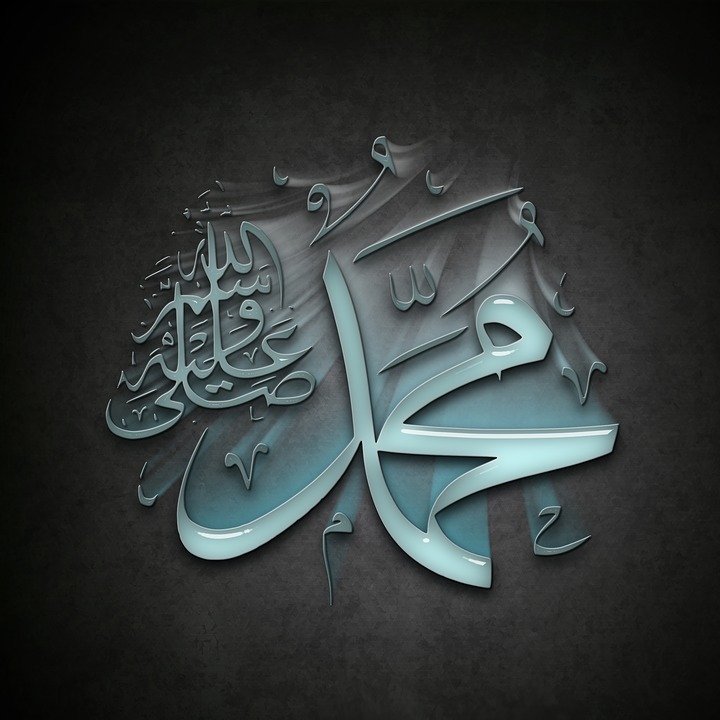 Sūrah Muhammad is the forty seventh Surah with 38 ayahs with four rukus, part of the 26th Juzʼ of the Holy Qur'an. The Surah is named after the last of the prophets of Allah, Prophet Muhammad (ﷺ) - the name of the Holy Prophet is mentioned in the second verse of the chapter. 1- Surah aal Imran (3:144) - وَمَامُحَمَّدٌ إِلَّا رَسُولٌ قَدْ خَلَتْ مِن قَبْلِهِ الرُّسُلُ - - and Muhammad is except a Messenger, many Messengers passed away before him..
2 - Surah al Ahzab (33:40) مَّا كَانَ مُحَمَّدٌ أَبَا أَحَدٍ مِّن رِّجَالِكُمْ وَلَٰكِن رَّسُولَ اللَّهِ وَخَاتَمَ النَّبِيِّينَ - Muhammad is not the father of your men but he is the Messenger of Allah and the seal of the Prophets)..
3 - Surah al Fat-h (48:29) مُّحَمَّدٌ رَّسُولُ اللَّهِ - Muhammad is the Messenger of Allah. وَمُبَشِّرًا بِرَسُولٍ يَأْتِي مِن بَعْدِي اسْمُهُأَحْمَدُ - [Jesus gave the good news of Prophet Muhammad] bringing good tidings of a messenger to come after me, whose name is Ahmad." Verse 23:39 of Surah Al Haj, is the first verse of the Quran in which "permission to fight" was given in the month of Zil-Hajj in the first year after Hijrah according as per scholars: "Permission (to fight) has been granted to those for they have been wronged.78 Verily Allah has the power to help them." Then the "command to fight" was given in (verse 190 of Surah Al-Baqarah) in Rajab or Shaban of A.H. 2: "Fight in the way of Allah against those who fight against you but do not transgress, for Allah does not love transgressors." Thus this Surah mainly focuses on the Battle of Badr - the first battle between the believers (Muslims) and the non believers (pagans of Makkah). Therefore one may find the language used in this Surah to be rather strong in tone for its purpose was to arouse the Muslims to take arms and fight the non believers who had mustered a strong army with a view to annihilating the Muslims. This Surah is almost an entire explanation of the last ayah of the previous Surah; Ahqaf (46) - a Makkan Surah. So bear with patience, (O Prophet), even as the Messengers endowed with firmness of resolve (before you) bore with patience, and do not be hasty in their regard. The Day when they see what they had been warned against they will feel as though they had remained in the world no more than an hour of a day. (The Truth has been conveyed.) Will any, then, suffer perdition except those who disobey? Besides this Surah, we also find commentary on Battle of Badr in Surah Anfal (8) while Surah at-Tawba has a commentary on the last of battles in the seerah (Fat-h Makkah - the capture of Makkah, and Tabuk). Hence, Surah Muhammad is a introduction to the first victory - Badr. And then Surah al-Fat-h (49) which is about the next victory of al Hudaybiah. The first verse of the Surah begins with the words "aladheena Kafaroo" (past tense/disbelieve disbelieved ) rahter than - "aladheena yaKfuroo" - those who disbelieve (present-future tense) - which would mean that their disbelief may change in the future. By using past tense - it is assuring that they will remain firm upon their disbelief for certain. 1 [ اَلَّذِيۡنَ كَفَرُوۡا وَصَدُّوۡا عَنۡ سَبِيۡلِ اللّٰهِ اَضَلَّ اَعۡمَالَهُمۡ‏ ] Those who disbelieved and debarred (others) from Allah's Way, Allah rendered their works fruitless. 2 And those who believe and do good, and believe in that which has been revealed to Muhammad - and it is the Truth from their Lord - He will remove their evil from them and improve their condition. In the verse 2 above, although after saying "those who believe" there was no need to say "and accepted that which has been sent down to Muhammad", for belief by itself implies believing in the Prophet Muhammad (ﷺ) and in the teachings sent down to him, yet making a separate mention of it is particularly meant to assert this. After the appointment of Muhammad (ﷺ) to Prophet-hood, a person’s belief in Allah and the Hereafter and the former Messengers and the Books cannot be beneficial until he also believes in him and the teachings brought by him. This explanation was necessary because after the emigration, the Muslims had also to deal with those who recognized and accepted all the requirements of the faith but refused to acknowledge and accept the Prophet-hood of the Prophet Muhammad (ﷺ). 3 That is because those who disbelieve follow falsehood, and those who believe follow the Truth from their Lord. Thus does Allah set forth their descriptions for men. In the verse 3 above, mention of two parties has been made to make them aware of their positions. One party insists on following falsehood; therefore, Allah has brought all its endeavors to naught. And the other party has adopted obedience of the Truth; therefore, Allah has purified it of its evils and corrected its condition. The verse 4 is the most important verse which calls on the believers to fight those who have wronged them since proclamation of Islam. 4 So when you meet in battle those who disbelieve, smite the necks; then, when you have overcome them, make (them) prisoners, and afterwards (set them free) as a favour or for ransom till the war lay down its burdens. That (shall be so). And if Allah please, He would certainly exact retribution from them, but that He may try some of you by means of others. And those who are slain in the way of Allah, He will never allow their deeds to perish. The words of this verse as well as the context in which it occurs clearly show that it was sent down after the revelation of the command for fighting and before the actual fighting began. The words, “So when you meet (in battle) those who disbelieve”, indicate that the fighting has not yet taken place and the Muslims are being instructed that when it does take place, what they should do. Here it may be pertinent to mention that The permission to fight the infidels was first given in Surah Al-Haj 22:39: "Permission (to fight) has been granted to those for they have been wronged. Verily Allah has the power to help them." However, it was in Surah Al Baqarah, verses 190 that the command to fight was given: "Fight in the way of Allah against those who fight against you but do not transgress, for Allah does not love transgressors." 5 He will guide them and improve their condition. The verse 6 below means that this is the profit that the martyrs falling in the way of Allah will gain. Its three grades have been stated: That Allah will guide them, That He will set their condition right and That He will admit them into the Paradise with which He has acquainted them beforehand. 6. And make them enter the Garden, which He has made known to them. 7. O you who believe, if you help Allah, He will help you and make firm your feet. If you help Allah: If you participate in the work of raising Allah’s Word with your life and wealth. At various places the Qur'an characterizes man's participation in the effort to establish the supremacy of Islam as 'helping Allah'. This needs a little explanation. Allah has endowed man with the freedom of will and choice, with the result that He does not resort to His omnipotent will to compel man either to do certain things or to refrain from others. He rather leaves man free to adopt the course that pleases him - be it that of either belief or unbelief, of either obedience or disobedience. Allah prefers to instruct man by means of persuasive argument and admonition, so as to bring home to him that even though he is free to disbelieve, disobey and defy the Will of God, his own interest and well-being lie in serving and obeying his Creator. Now here are few verses about the about the disbelievers. It has been said that they are deprived of Allah's support and guidance: none of their designs will succeed in their conflict with the believers, and they will meet a most evil fate both in this world and in the Hereafter. They thought they had achieved a great success by driving the Prophet of Allah out of Makkah, but in fact by this they had hastened their own doom. 8. And those who disbelieve, for them is destruction, and He will destroy their works. 9. That is because they hate that which Allah reveals, so He has rendered their deeds fruitless. 10. Have they not traveled in the land and seen what was the end of those before them? Allah destroyed them. And for the disbelievers is the like thereof. The verse below has two meanings: (1) The same destruction that was met by those disbelievers now awaits these disbelievers, who are not accepting the invitation of Muhammad (peace be upon him). (2) The ruin of those people does not end with the torment of the world; the same doom also awaits them in the Hereafter. 11. That is because Allah is the patron of those who believe, and because the disbelievers have no patron. The verse 11 is in reference to Battle of Uhud. After being wounded when the Prophet (ﷺ) was resting in a hill pass with a few companions, leader of the pagans of Makkah Abu Sufyan shouted: We have Uzza and there is no Uzza for you. Thereupon the Prophet (ﷺ) told his companions to respond, saying: Our Protector and helper is Allah, and you have no protector and helper at all. This reply of the Prophet was derived from this very verse. 12. Surely Allah will make those who believe and do good enter Gardens wherein flow rivers. And those who disbelieve enjoy themselves and eat as the cattle eat, and the Fire is their abode. The second part of the verse 12 above is for the disbelievers. That is, just as an animal eats and does not think where from the food it eats has come, who has created it, and what rights of the creator are imposed on it for providing it with food, so are these people also eating and have no higher values or ideals beyond eating. The Prophet (ﷺ) was sorely distressed on leaving Makkah. When he was compelled to emigrate, he had stood facing the city outside it and said: O Makkah, you are the most beloved city in the sight of Allah, and I have the greatest love for you out of all the cities of Allah. If the polytheists had not driven me out, I would never have left you. 13 And how many a town, more powerful than thy town which has driven thee out - We destroyed them, so there was no helper for them. Thus in verse 13 it has been said: After driving you out of the city the people of Makkah think that they have achieved a great success, whereas, in fact, they have hastened only their own ruin by this evil act. The style of the verse clearly indicates that it must have been revealed soon after the Hijrah. 14 Is then he who has a clear argument from his Lord like him to whom his evil conduct is made fair-seeming; and they follow their low desires. That is, how is it possible that when the Prophet and his followers have been guided by God to a clear and straight path and they have started following it in the light of full knowledge and vision, they should walk along, with those who are still persisting in their ways of ignorance, who regard their deviation as guidance and their evildoing as a praiseworthy thing, and who judge on the basis of their personal desires, and not by argument as to what is the truth and what is falsehood. Now, neither can the lives of these two groups be alike in this world nor can their end be alike in the Hereafter. The verse 15 paints an inviting landscape of Paradise, which is being promised to the believers who remain steadfast in their pursuits to bow to the Divine commandments and teachings of the Prophet of Allah. 15 A parable of the Garden which the dutiful are promised: Therein are rivers of water not altering for the worse, and rivers of milk whereof the taste changes not, and rivers of wine delicious to the drinkers, and rivers of honey clarified; and for them therein are all fruits and protection from their Lord. (Are these) like those who abide in the Fire and who are made to drink boiling water, so it tends their bowels asunder? The milk mentioned above will be unique and pleasant to drink. In a Hadith directly reported from the Prophet (peace be upon him), it has been explained thus: It will not be the milk squeezed from the milk glands of animals. That is, it will be the milk which Allah will bring out in the form of springs from the earth and cause it to flow into canals of Paradise. About this natural milk it has been said: Its flavor will not change at all; that is, it will not give even the slightest offensive smell that is found in every kind of milk squeezed from the animal milk glands. 16. And there are those of them who seek to listen to thee, till, when they go forth from thee, they say to those who have been given knowledge: What was it that he said just now? These are they whose hearts Allah has sealed and they follow their low desires. It addresses those disbelievers and hypocrites and unbelieving followers of the former Books, who sat in the assemblies of the Prophet (peace be upon him), listened to his discourses, or the verses of the Quran, but since in their hearts they were averse to the themes presented by him, they would understand nothing in spite of listening to him. Therefore, when they came out, they would ask the Muslims: What was he saying just now? 17 And those who follow guidance, He increases them in guidance and grants them their observance of duty. That is, the same revelations about which the disbelievers and hypocrites ask: What was the Prophet (peace be upon him) saying just now? become a cause of further guidance for the rightly guided people, and from the same assembly from which these unfortunate people rise without gaining anything, the fortunate ones return with a new treasure of knowledge and insight. is, Allah grants them the grace to develop in themselves the kind of piety Taqwa that they have the capability to develop. 18 Wait they for aught but the Hour that it should come upon them of a sudden? Now tokens thereof have already come. For how will they have their reminder, when it comes on them? That is, as far as the explanation and clarification of the truth is concerned; it has been explained well by argument and reasoning, the miraculous discourses of the Quran, the pure character of the Prophet Muhammad (peace be upon him) and the revolution in the lives of his companions. Now, are these people awaiting that Resurrection itself should take place and then only they will believe? 19 So know that there is no God but Allah and ask protection for thy sin and for the believing men and the believing women. And Allah knows your moving about and your staying (in a place). 20 The believers used to say: “Why is a surah (that would ordain fighting) not revealed?” But when a definitive surah was revealed wherein fighting was mentioned, you saw that those in whose hearts there was a sickness looked at you as though they were about to faint at the approach of death. Pity on them! The verse 20 is in view of the conditions through which the Muslims were passing and the attitude that the disbelievers had adopted towards Islam and the Muslims. The believers were generally of the opinion that they should be permitted to fight even before fighting was actually enjoined by Allah. Rather they were asking Allah’s command in this regard impatiently and were asking again and again: Why are we not permitted to fight these wicked people? But the condition of the people who had joined the ranks of the Muslims hypocritically was quite different from that of the believers. They held their lives and their properties as dearer to themselves than Allah and His religion, and were not prepared to risk them at any cost. Therefore, as soon as fighting was enjoined, they were clearly sorted out from the true believers. Until the time when fighting had not been enjoined, the hypocrites and the common believers could not be distinguished one from the other. The hypocrites offered the Prayer just as the true believers did, they observed the Fast just like them, and practiced every article of the faith as made no demand of a sacrifice on them. But when the time came for making the supreme sacrifice of life for the sake of Islam, their hypocrisy was exposed and their veil of false display of the faith was rent asunder. In Surah An-Nisa, their this state has been described thus: Have you marked those to whom it was said: Withhold your hands a while and establish the salat and pay the zakat? Now that the fighting has been enjoined for them, some of them fear the people as they should fear Allah, or even more than that. They say: Our Lord, why have You enjoined fighting for us? Why have You not given us a brief respite? 21 Obedience and a gentle word (was proper). Then when the affair is settled, it is better for them if they remain true to Allah. 22 But if you turn away, you are sure to make mischief in the land and cut off the ties of kinship! 23 Those it is whom Allah has cursed, so He has made them deaf and blinded their eyes.24 Do they not reflect on the Qur'an? Or, are there locks on the hearts? 25 Surely those who turn back after guidance is manifest to them, the devil embellishes it for them and lengthens false hopes for them. 26 That is because they say to those who hate what Allah has revealed We will obey you in some matters. And Allah knows their secrets.27 But how will it be when the angels cause them to die, smiting their faces and their backs? 28 That is because they follow that which displeases Allah and are averse to His pleasure, so He makes their deeds fruitless. 29 Or do those in whose hearts is a disease think that Allah will nor bring forth their spite? 30 And if We please, We could show them to thee so that thou shouldst know them by their marks. And certainly thou canst recognize them by the tone of (their) speech. And Allah knows your deeds. 31 And certainly We shall try you, till We know those among you who strive hard, and the steadfast, and manifest your news. 32 Surely those who disbelieve and hinder (men) from Allah's way and oppose the Messenger after guidance is quite clear to them, cannot harm Allah in any way, and He will make their deeds fruitless. 33 O you who believe, obey Allah and obey the Messenger and make not your deeds vain. 34 Surely those who disbelieve and hinder (men) from Allah's way, then die disbelievers, Allah will not forgive them. 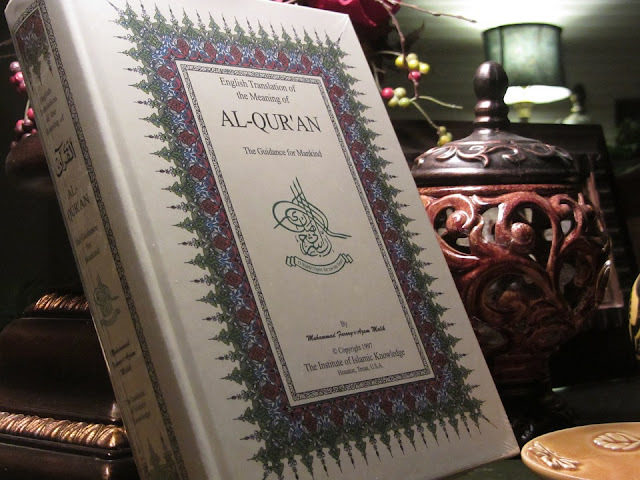 To better understand the verse 35 below, one should bear in mind the fact that when this discourse was revealed only a handful of the Muslims consisting of a couple of hundreds of the Muhajirin and Ansar living in the small town of Madinah were upholding the standard of Islam and they were not only faced by the powerful Quraish but also by the whole of pagan Arabia. 35 So, be not faint-hearted and do not cry for peace. You shall prevail. Allah is with you and will not bring your works to nought. Such were the conditions when they were exhorted not to show weakness and not to beg (the enemy) for peace, but to make preparations for the decisive conflict. This does not mean that the Muslims should never negotiate for peace, but it means that in a state like this it is not right to initiate peace negotiations when it shows the Muslims’ weakness, for it will still further embolden the enemy. The Muslims should first establish their superiority in power and strength; then if they negotiate peace there will be no harm. 36 The life of this world is but idle sport and play, and, if you believe and keep your duty, He will give you your reward, and He does not ask of you your wealth. 37 If He should ask you for it and press you, you will be niggardly, and He will bring forth your malice. In conclusion, the Muslims have been invited to spend their wealth in the cause of Allah. Although at that time they were economically very weak, the problem that they confronted was the very survival of Islam and the Muslims. 38. Behold! you are those who are called to spend in Allah's way, but among you are those who are niggardly; and whoever is niggardly, is niggardly against his own soul. And Allah is Self-Sufficient and you are needy. And if you turn back He will bring in your place another people, then they will not be like you. The importance and delicacy of the problem demanded that the Muslims should not only risk their lives for safeguarding themselves and their Faith from the dominance of disbelief and for exalting Allah's Religion but should also expend their economic resources as far as possible in the preparations for war. Therefore, they were clearly warned to the effect. Anyone who adopted a niggardly attitude at the time, would not, in fact, harm Allah at all, but would result in his own destruction, for Allah does not stand in need of help from men. If one group of men shirked offering sacrifices in the cause of His Religion, Allah would remove it and bring another group in its place.